If your computer is loaded with softwares and applications, the start up of your windows will take good amount of time. Many programs tend to add themselves in program’s list and get started once you boot the computer, this list can be long. Editor’s Note: Apparently our geeky readers know a lot about this, however this article addresses everyone. Feel free to enhance your knowledge and share with your friends who are non-techie! If you use Windows 8/Windows 10, please scroll down. Most programs have this smart feature to start with the Windows, for example anti-virus or firewall software. On the other hand, many programs don’t start at the boot-up to avoid wastage of resources and extended start-up time. A tool named MSConfig is installed with the Windows to quickly as well as easily spot what’s running during the start-up. This lets you disable any program that you do not want to run at the startup of your windows. 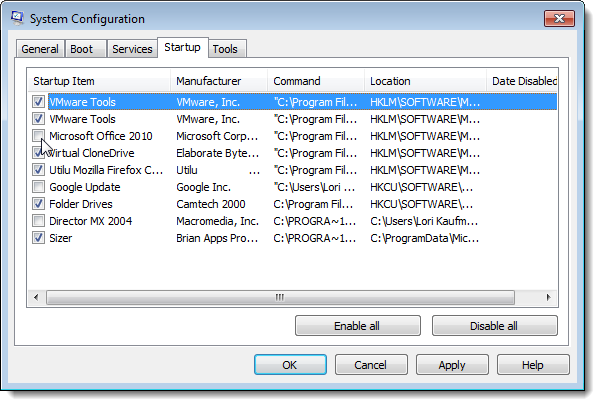 This available tool helps to disable any startup program in Windows XP, Windows 7 and Vista. NOTE: MSConfig is also used for configuring several other things than startup programs, hence be careful with it. In case you aren’t sure, just follow steps in our article and things will work fine. 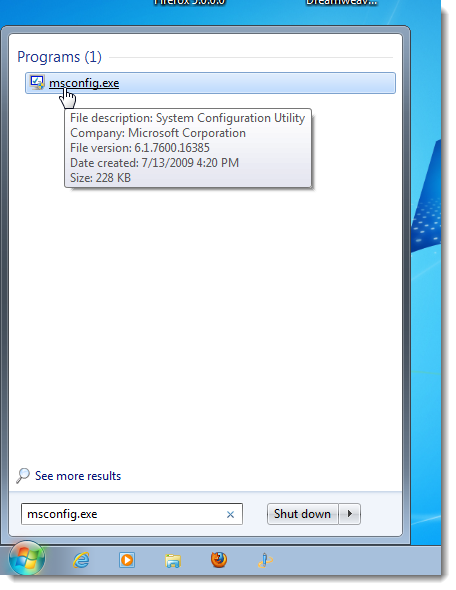 For MSConfig, first open Start menu, type in the Search box “msconfig.exe” (obviously without quotes). When you type, you will see the results displayed. Once you distinguish “msconfig.exe,” press Enter or click it, if it’s highlighted. NOTE: In case of Windows XP, first open Run dialog box in the Start menu, then type “msconfig.exe”, you will see Open edit box in that click OK.
Click on the Startup on your main window of System Configuration. You will see all start-up programs listed having a check box at each one. For preventing a program from start up in Windows, the check box at desired program must be selected so that there’s NO check in that box. Lastly, Click OK as soon as you’ve made the choices. You will see a dialog box displayed asking you to restart the computer for changes to take effect, therefore, Click Restart immediately. If you don’t want to restart the computer, click on Exit without restart. 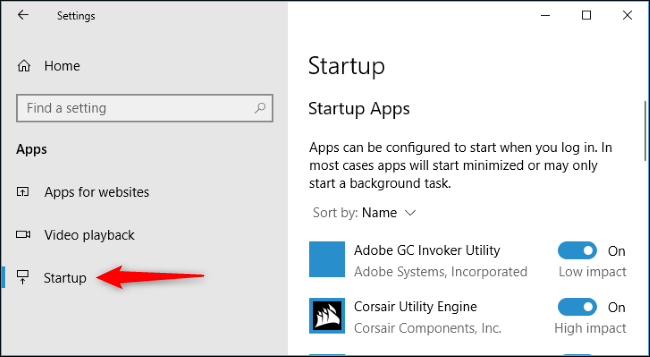 If you are running the latest Windows 10 version, an easy to use new Startup Apps management panel will disable the startup programs. Open Settings, search “Startup”, and open Startup Apps panel. In case you do not see this, it means you must install the latest version.now will have to use the Task Manager for managing your apps in windows startup (keep reading the next section). Having the Startup Apps panel in your computer helps you to simply toggle stuffs you don’t need to run in the startup. Be it Windows 8, 8.1 or windows 10, disabling startup applications have always been easy and quick. You just have to open Task Manager (right-click on Taskbar or CTRL + SHIFT + ESC), click on “More Details,” switch to Startup tab, and then use Disable. This is really simple. In case, you don’t see these options, click on “More Details,” it’s located at the same spot as “Fewer details” shown in the screenshot above. Since we are talking about disabling stat up programs, the free CCleaner also lets you to easily disable programs at the start up. Open CCleaner, click Tools located at left and on click Startup where you can see the listed startup programs. Remember, the Enabled column shows programs set to get started with Windows. If you want to disable any program, select that program and click on Disable. Disabled programs can also be enabled quickly and easily. NOTE: CCleaner doesn’t prompt you for a computer restart, so make sure you do it yourself. You will also find a Professional version of CCleaner which costs $24.95 but it comes with great priority technical support. Though, there’s a free version also available as a portable and installable version. Remember that some applications require configuration to stop starting when your computer boots or the list of your startup programs will get filled up. So in such case, you will have to go to program’s options and do a setting to prevent them from getting started with the Windows.